Mind mapping as a way to visualize and express ideas has been around since the ancient Greeks and remains as useful as ever. 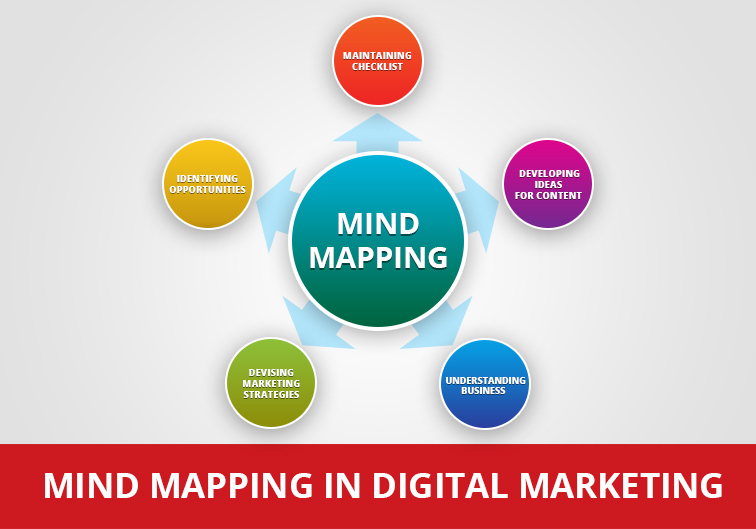 The applications for mind maps are endless, from brainstorming and conceptualization to planning and presentations, but here are some uses specific to digital marketing. If you’re a digital marketer who manages multiple social media accounts for a multitude of clients on a daily basis, it can get complicated and confusing to keep track of them all. A mind map can help you keep tabs on all channels as well as the activities associated with each channel. One of the challenges of digital marketing to consistently produce fresh, exciting content that helps the clients to achieve their goals. Online mind mapping software like MindMaple or Freemind can make it far easier to brainstorm, visualize and structure ideas for new content. When a client partners with an agency to acquire more sales, the first task of the digital marketer is to understand their business from the inside out. This stage is always marked by meetings and a lot of back-and-forths. One way to make this simpler and quicker is to map out the client’s business model using pen and paper – including their company activities, areas of business he wants to highlight and the services they offer in each field. Digital marketing today refers to a broad spectrum of marketing using digital technologies from PPC and display advertising to social media and content marketing. Each one requires a customized strategy. Mind maps are an ideal way to map out digital strategies – they can be used at every stage of the strategic process from brainstorming to developing tactics. By visualizing information, mind mapping can help you spot opportunities you may not have noticed, as well as patterns in your past and current marketing strategies. You might also realize that certain tactics may not work for your overall marketing goal. Whether you prefer online tools or a simple pen and paper, mind maps are a digital marketer’s best friend, thanks to their clarity and efficiency. For sixteen years, we have been transforming and shaping digital experiences for local and international clients in the UAE, Middle East and India. Contact our digital marketing specialists and learn how we can help fuel your brand’s growth on digital platforms.